The guy behind the idea of the English-language Totalcar site, the totalcarmagazine.com, also serving as an editor at the Hungarian totalcar.hu , our mother site. Serial collector of sorry old things that have internal combustion engines in them, as a newfound religion, Zsolt is keeping a family under the terror of rust. Being in the business for the best part of the last 19 years, he landed at Totalcar after serving at a huge round of printed automotive magazines. Has a wife, two small(ish) children and a pet rabbit. A Volga – no doubt! But why is it yellow? Was the original Fiat better than the Lada? Car of the Year 2014 - it's a French car! There is just a very thin line between a useable classic and a wreck. 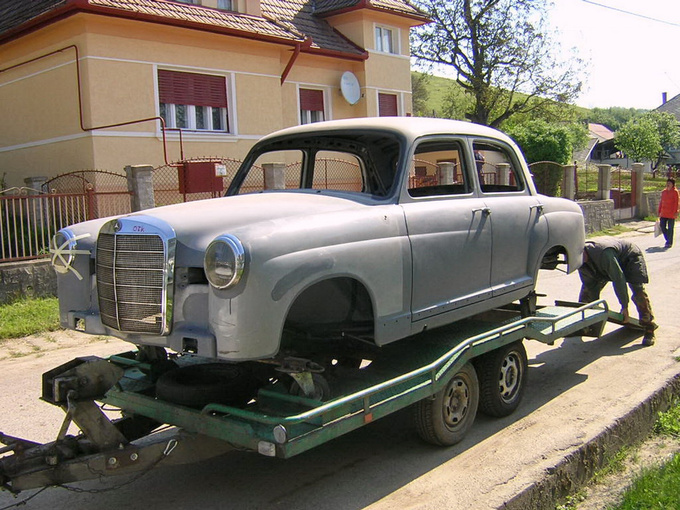 When I bought my 1962 Ponton Mercedes I thought it is one of the former. After having looked at it a little closer, I had a suspicion: could it be the latter? 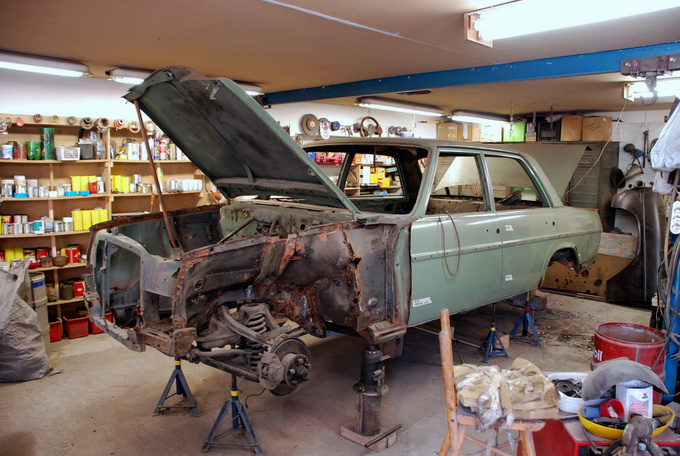 From the moment on when you start restoring a classic car, you'll have no more earthly needs. A hobby like this is bound to make you steer clear of easy women, partying, expensive wines, skiing in Chamonix and the only time you'll ever visit the casino is when you're sitting on the stairs in front of it with a paper cup in your hands begging for money. In times when you are paying professionals by the hour, when you're hanging on ebay and buying blindingly expensive stuff twice, three times a week there'll be no money left for the others in your household either. Your wife will quit wasting money on fancy clothes, your son will give up his addiction for new xBox games and your daughter will cut visits to the cosmetician to a trickle. You'll find yourself in medieval times, no question. When I was staring at the dismembered body of my Ponton at the welder's in the Hungarian city of Eger, I felt like a fortune teller having an unusually high-definition crystal ball for telling the future. I knew what was going to happen: had I been a detective, and was this a murder story, I could have pointed my fingers at the guilty in that very moment. I've been through this story with my Autobianchi Bianchina, my Mercedes 200 D/8 and have already embarked on a similar journey with my never-to-be-finished Steyr-Puch 500 years ago. All of them had the promise of a relatively easy project, and finally all of them turned into a devastator of our family assets. I bought this Ponton in Sweden, 2700 kms away from home at the end of the winter (and tried to drive it home – that part of the story was covered here, here, here and here). It seemed to be a sound car that was neglected a bit. No rust, said the description on ebay, good brakes, renewed engine, nice interior, bad paint. The last two proved to be true. This part was already suspicious in that garage in Domsjö, but here, at the welder's, I could see that the base of the left A-pillar, where it meets the sill, was a complete mess with huge blobs of the car apparently missing. Sometime in the car's past a bent piece of metal sheet was bodged in here to conceal the hole and lots of silicone paste-on sealant was used to cover up the horror. Send my best regards to the genius in Karlstad who did this. 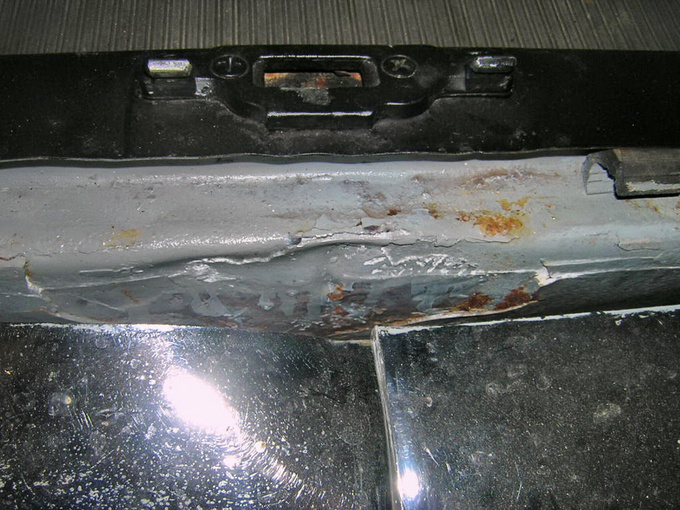 This was the worst part of the car's bodywork but there was more bad news to come. I left Eger and Csabi, my welder friend, with a sinking feeling in my stomach. 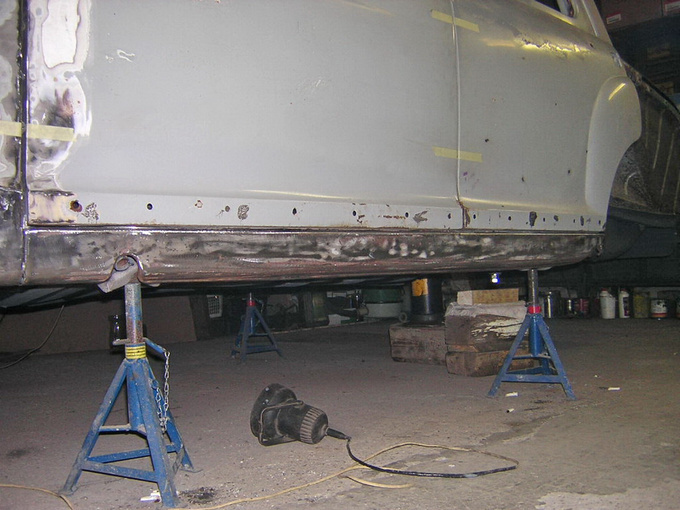 Upon buying the Ponton really looked good, many of my friends who have spent lots of time around classic cars – either as professionals or as hobbyists – said that it was unbelievable how healthy the body of the car was. But now I had a different opinion. In the next weeks my good man Csabi started to dismantle the car and set to scraping all the sealant that covered the bottom of the car like thick gravy on boiled potatoes in a bad factory cafeteria. I've been through tough cars with Csabi in former years, but the sticky black goo on the underside of my Ponton nearly made him go berserk. It took him the best part of a month to get everything clean and accessible. 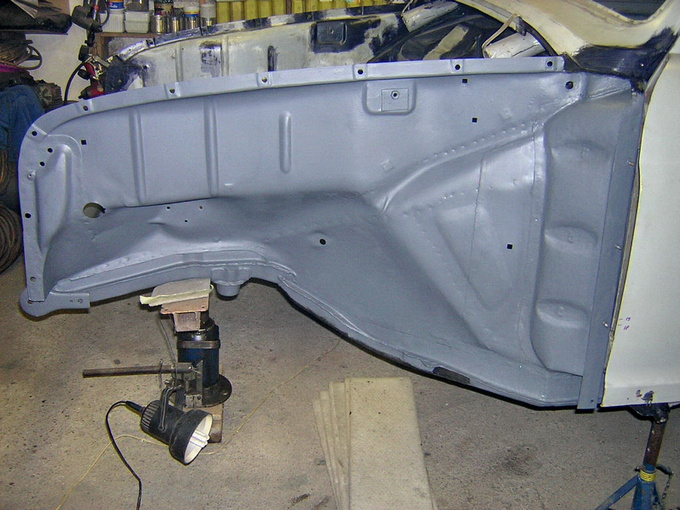 I could have had the body sandblasted at this point, but it would have involved transporting it a lot and anyways, painters don't really like sandblasted bodies, because their work is often ruined by leftover sand being blown out of cavities when they are finishing the car. As for me, I don't favour sandblasting either, because I've seen one too many car bodies rendered useless by excessive blasting with wavy roofs, undulating bonnets and sides like the Atlantic Ocean in a bad storm. Csabi agreed to scrape everything off at the cost of a normal sandblasting and I wasn't the one to put up a fight. After finishing with that job, in the next few months he dug deeper in the mysteries of my Ponton's body. And he found some more tasty horror. The first of these was the kickplate on the front passenger side, which at first (and at second) seemed to be solid. But it moved a bit at the press of the finger. Csabi cut it out, held it towards the light and voilá!, you could see all the microscopic holes in it right away that were not much bigger than a needle's pointy end. New metal went in, yepeee, it was ready. He also had to replace a part on each one of the longitudinal supports where the steering box and the idle arm were located. 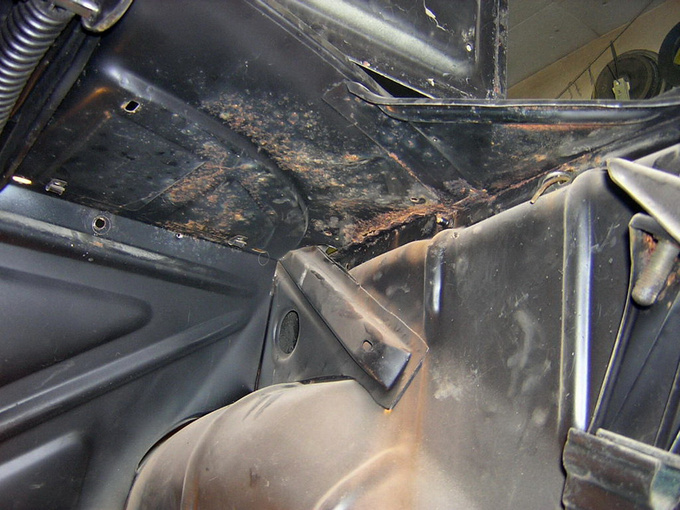 After finding all this rust, he became really curious about the intact-looking offside A-pillar, too, especially because he found that the cardboard cover at the side of the right side footwell isn't fitting properly. A small step, an indent of about 5 mms was missing from the vertical wall behind it thus making a flush fit impossible. 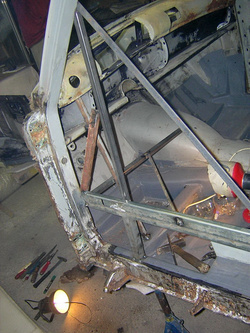 After noting down the exact measurements of the body and making an intertwined brace system within the passenger area worthy of the Eiffel Tower to keep all dimensions in position, he first cut out all the rot on the nearside (where it was apparent that everything had to be remade) A-post. After that he cut out the intact-looking parts of the offside (right) A-post layer by layer (there are three sheets of steel here to strengthen the body) to obtain some patterns, mirrored them to the left side on cardboard and made each part by hand from sheet steel. He put everything back, layer by layer. 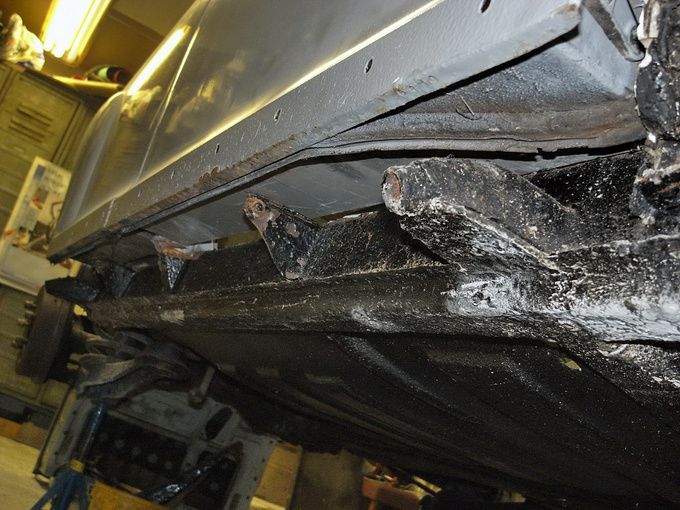 With this he got to ends with the worst area of the car, the bottom of the nearside A-post. Then he got to work on the bottom of the offside A-post too, which was also disintegrating, as he found out. How I wished in those times that a hand would sometimes extend from the sky and stop Csabi's never resting arm when he grabbed that plasma cutter... But in the end he was always right of course, except he didn't have to quarrel with his wife at the end of each month, as I had to. His curiosity and stubborn determination to put everything perfect was starting to cost me a fortune. When he was ready with the front of the car (the structure at least), he started moving backwards. 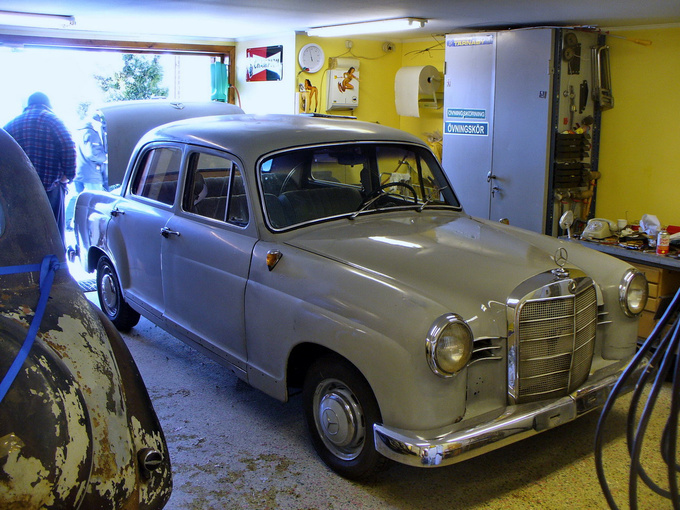 Many think that the Ponton Mercedes got its name from its monocoque (or unitary) shell, which, by the way, was a first of its kind in the firm's history. But if we dig into old literature we may discover that the German automotive terminology used to put the ‘ponton' tag (the name comes from similarity with pontoon bridges) on any kind of car that didn't have separate wings, which had a smooth body with lights integrated into the wings, and had no protruding sills under its doors. If you take this meaning the W120 (and the larger W180) series Mercedes has a right to be called Ponton. But in fact, it isn't a real monocoque chassis at all. If you look at it from below, you can see a ladder rail chassis not dissimilar to the one on the earlier 170 series. But here the body is welded, rather than screwed, onto the frame. Of course the chassis rails are set a bit wider apart and at the front footwell there is no straight continuation of the rails. But all in all it is a surprisingly ancient-looking setup, it was clearly designed by people who had worked only on separate framed cars before. Since it is not a monocoque as we know it today, the sills on this car aren't there to support the body as they would in today's cars. They are just screwed-on items which allow the doors to be brought out to the sides of the body so that they can be flush with the pontoon wings. In fact you can stick a hand under these sills and you'll find a cavity there, since the real supporting member runs much deeper under the body. Then these are just fancy items and they are there just to cover up the gap under the doors, am I right? Not really. In fact, they are sturdy pieces of form-steel which the passengers usually step on when entering the car. They have a few small outriggers on the underside to make them solid. And they tend to rust where the sheet metal meets these outriggers. 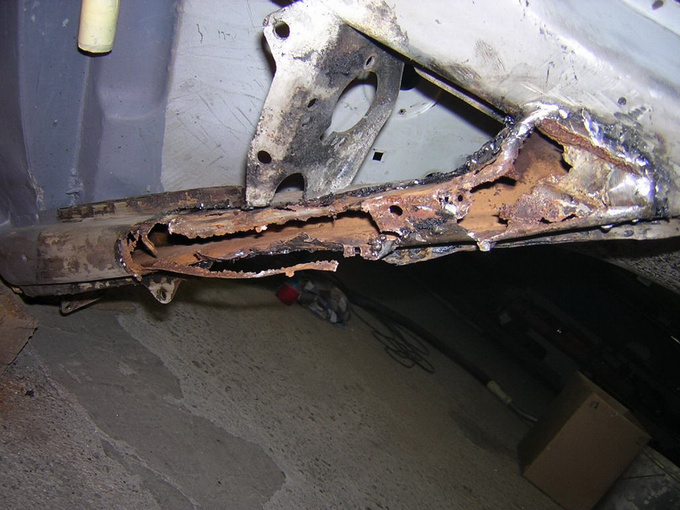 After removing them Csabi discovered that my car's sills were corroded at the supports – how could I have hoped that they wouldn't be...? 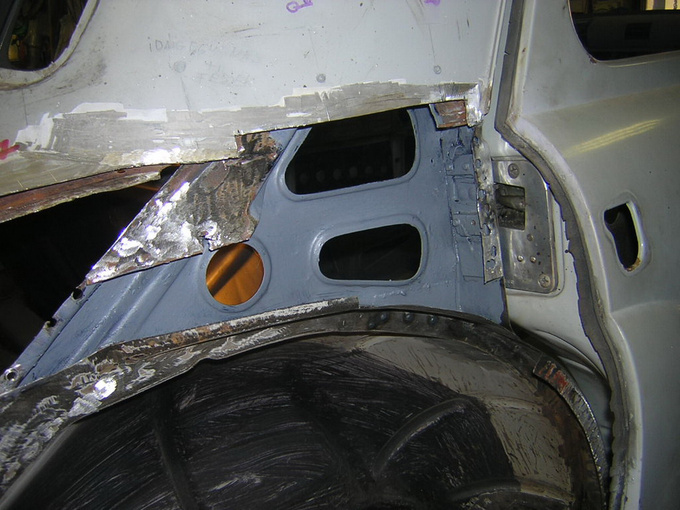 In fact, there was some bodgery here, too: Csabi found a rectangular piece of steel riveted on the largest and most apparent hole under the right side rear door. Another big cheer to that repairman in Karlstad, skøl! 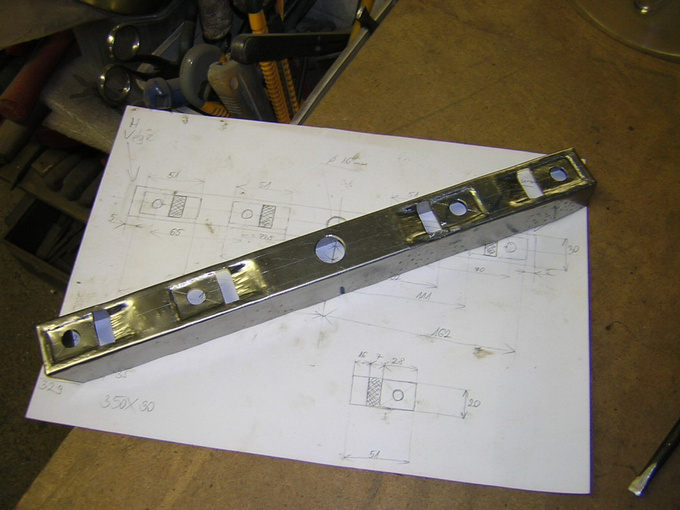 Thus all the outriggers had to be reconstructed, the sills had to be reshaped (they were all bent and rusty), perfect-fitting patches had to be let in. 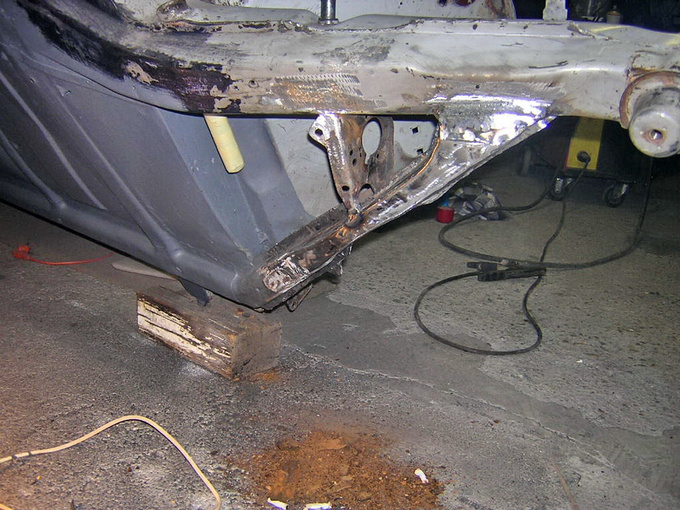 The base of the B-pillars was also cut, cleaned from the inside and put back. 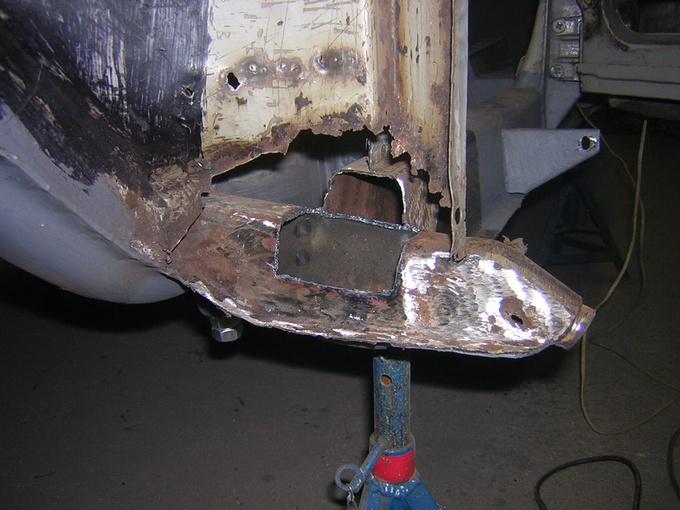 It is interesting how little rust we found in some parts of the chassis when we know that at the time the Ponton Merc was constructed, the makers didn't apply any kind of protection to the inside of the cavities, they were just unprotected steel. The designers had probably hoped that no water would ever enter here, so they sealed everything perfectly, or at least they thought so. Today we know that water and mud do enter these cavities and should be allowed to leave the structure of the car, but then... 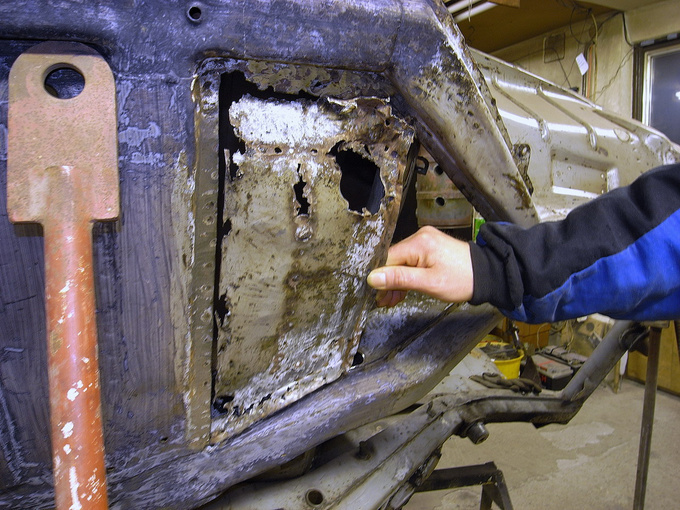 So these early monocoque-chassis cars can rust terribly from the inside, one has to accept that when dealing with such machinery. Keeping this in mind Csabi decided to open up every single cavity on my Ponton and have a look into them – he really hates rust, you see. And alas, as the rear suspension was removed and the spring bases were cleaned, one large crack on each side of the longitudinal member was revealed. As I found out later, this is a common rot point on Pontons, the trouble is that it cannot be noticed without taking the rear end of the car to pieces. 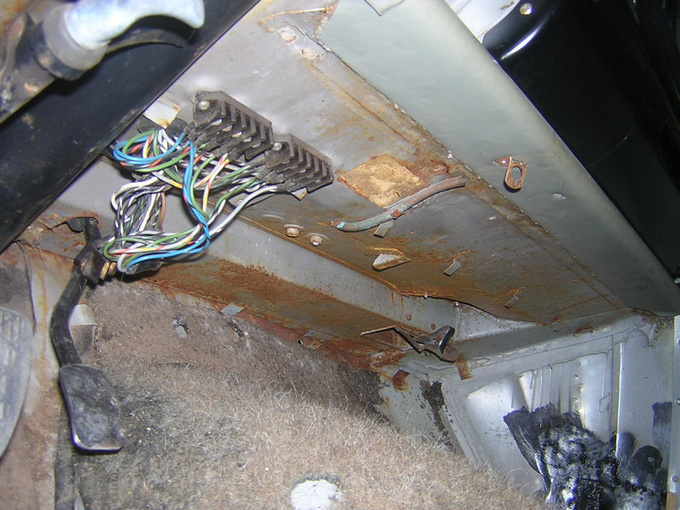 What often happens if you neglect this area is that the spring hammers its way through the corroded chassis until it stops at the base of the rear seat. By the time you notice that the car's back end has sunk a bit, you could already be in deep trouble. Luckily, this member wasn't gone too far on my Ponton. When the frame of the car was more or less ready, Csabi had a go at aligning the doors with the body, just to see how things are standing. But those doors, well, they just wouldn't mate with the other panels properly. He soon discovered that the rear door locks were in the wrong place – from new! 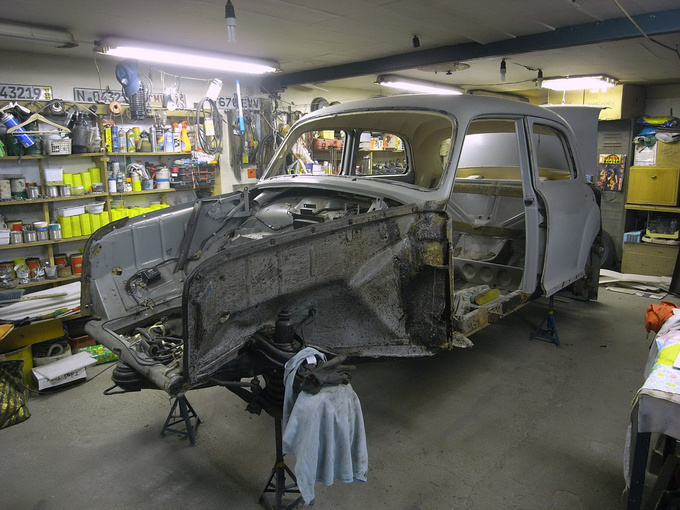 There is a Swedish guy who is restoring his father's Ponton 219 and is also writing a blog on the repairs of his car (I hope he's finished with it by now). The chap is a maniac: at one time he started measuring the gaps on all the Pontons he saw. He found that at the doors these should be 4.2 mms wide as specified by the factory but on unmolested, real-life cars he measured everything between 1.5 and 7 mms. He also realized that this is not the only aspect in which the manufacturing precision on Mercedes-Benzes of old can be criticized: the parcel shelf on all Pontons is asymmetrical, its curvature is very much different at its two ends. And there is a point where the rear valance, the rear wing and the bootlid meet up: the alignment of the panels is extremely bad on all Pontons. You have to live with the fact that these cars weren't built by robots but by humans. Of course Csabi isn't the kind who can overlook such imperfections. The cars he makes have to be perfect by today's standards, full stop. But no matter how much he tried, it wasn't possible to move the rear locks far enough in their seats to make the doors align with the rest of the body. Lacking any better idea he remade the mountings for them in the body. 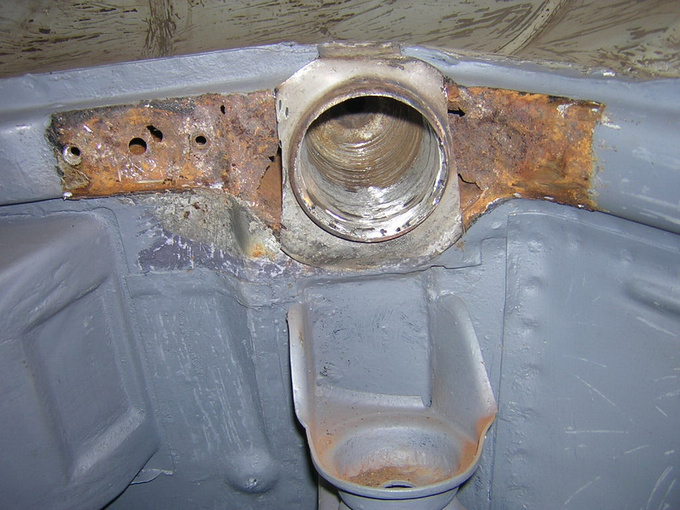 These had to be moved downwards, but while he was at this – you wouldn't have guessed - he found some more rust which was absolutely invisible from the outside before; in fact, one of the locks was held by only some thin, rotten strips of metal. The rear ends of the sills needed some work, too, but that wasn't a major issue. From here, only the rearmost end of the car needed some more looking at. Now with the rust patches revealed he couldn't do anything but dig deeper. This is the area where the panel of the roof (the C-post), the inner wings, the parcel shelf and some braces all meet. After cutting deeper and deeper there were spots where he found four rusty layers of metal. I still can't think of a safe method to spot a rot stem originating here, because it is covered up so well from the outside by the wing top and the headlining on the roof also hides it from the direction of the interior. 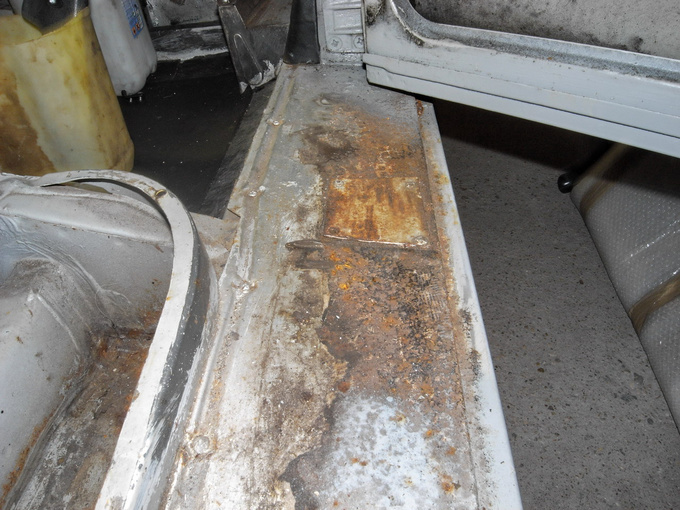 Maybe if you climb into the boot and look upwards with a strong flashlight, you would have a chance to spot the developing rust, but by the time you see it, the extent of corrosion is really bad. It is a safe guess to say that about 99 percent of Pontons that are unrestored or have been restored and used all have this problem. 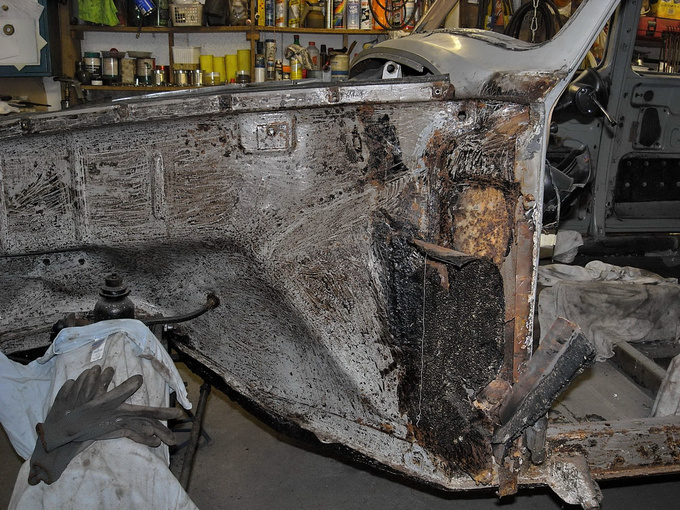 Two weeks were needed for each C-pillar, huge amounts of rusty steel emerged. And of course, there was corrosion at the tops of the inner wings, too, but luckily the boot floor only needed a good cleaning, since it just had some surface oxidization. When the structure was spot on, Csabi again tried on the four wings, the doors, the boot lid and the bonnet to spot anything that still needed correction. The rear valance was found guilty, first round. When the lorry crashed into my Ponton on the way home from Domsjö, it wasn't only the wing and the bumper that was bent. This valance also got a blow, but it must have soaked up the forces of another collision too earlier in its life, because the middle section was full of filler and its arc wasn't right either. Just this part took most of a week to put straight. 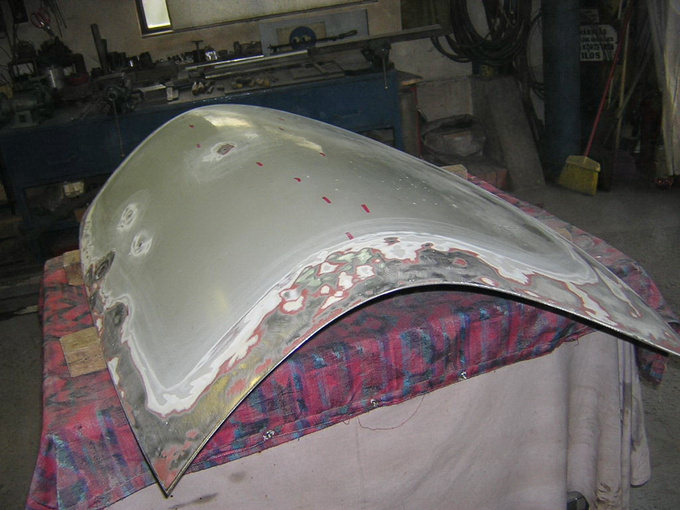 And when it was ready, Csabi found out that the boot lid wouldn't close properly; it proved to be out of shape also. It had to be carefully massaged back to shape, starting with the inner structure, but of course the bug with the name corrosion stuck its head out all around the edges. Another medium-major job. All these problems were invisible when the car was in one piece, but now, when everything was getting back into original shape, they really showed. Up to this point about five months passed (Csabi cannot work any faster, because he works alone, rarely having a pair of hands to help him) but finally I had a 1962 Ponton body that was better and more precisely manufactured than when new. My spirit was soaring, although the funds were dwindling, the wife was also developing an angry brow, the kids forgot what the word ‘chocolate' meant and we ate cold mud for dinner on Christmas Eve. Who cared? 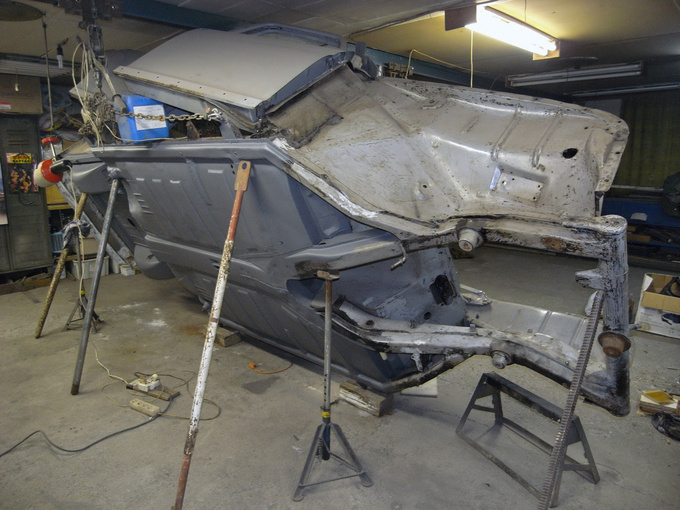 In February and March Csabi occupied himself with all the panels that cover up the structure of the car. 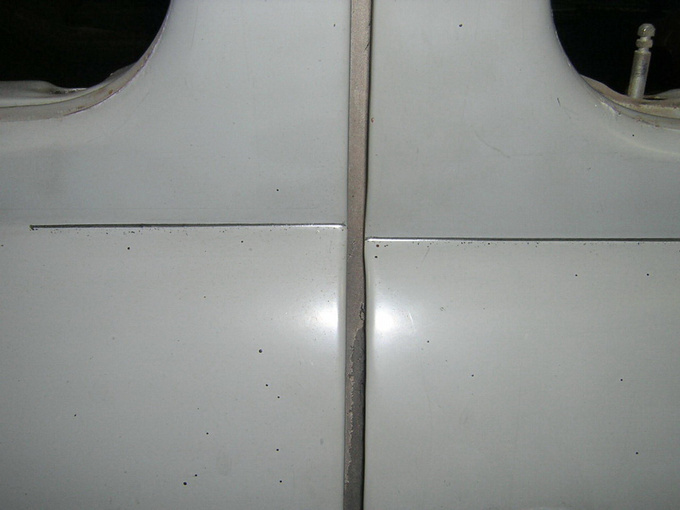 Although a Ponton-owning friend gave me most of the parts on his spare car after we had a nice day of tearing it to pieces, the right rear wing couldn't be salvaged from that – after some thorough cleaning we found that there were two horrible patches on it and anyways, the whole panel was completely out of shape. I started looking at useable wings on ebay (they go for around 100-200 Euros), but Csabi said: “Look, yours doesn't have rust on it, it is jus' a little bent. I can fix it in about a week, so moneywise you're in the same situation. Let me fix it, I feel it's safer to keep the original part”. There were small blemishes (rust and dents) on all the wings, especially on the front ones around the lights, the doors needed minor welding also. Under the synthetic leather covering the dashboard another large patch of rust was found and even the parcel shelves had lots of iron-oxide marks on them. Everything was remade, panel by panel, Csabi even designed complete new seat stands from what he cut out of the floor. They are a work of art now. By the end of March everything was ready. Everything! The body of my Ponton was put together so that all the lines, gaps, alignments could be checked thoroughly. The lights were installed, the mask was put on, the door handles screwed in their place. 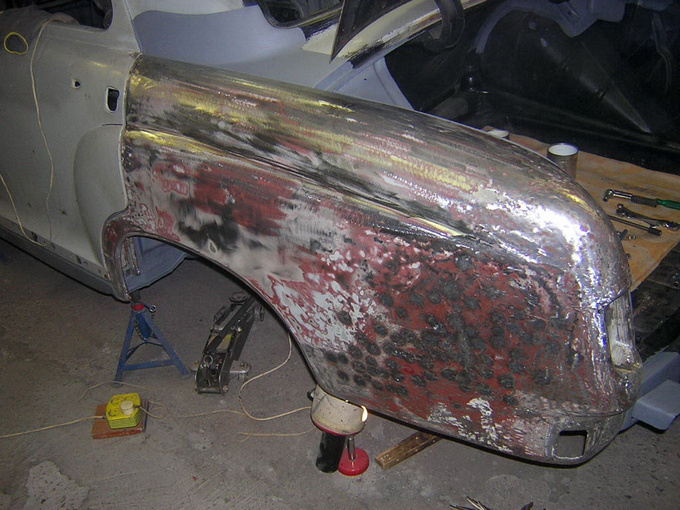 Even with all the patches of anti-corrosive base paint, the car looked terrific – we knew that not a minor stem of rust was left on or within it, anywhere. You could have run a high-speed magnetic train on the edges of the body they were so straight – providing that you can find anything like an edge on a potato-looking car like a Ponton Mercedes. Looking back I'm tempted to say that the car wasn't really bad, it was certainly worth its price at 5400 euros. At this point of the restoration I was already looking into more than double that and I hadn't counted the parts for the suspension, brakes, electrics, the engine et al that I spent on. In fact, the Ponton was so good it kept about 90 percent of its own body panels. 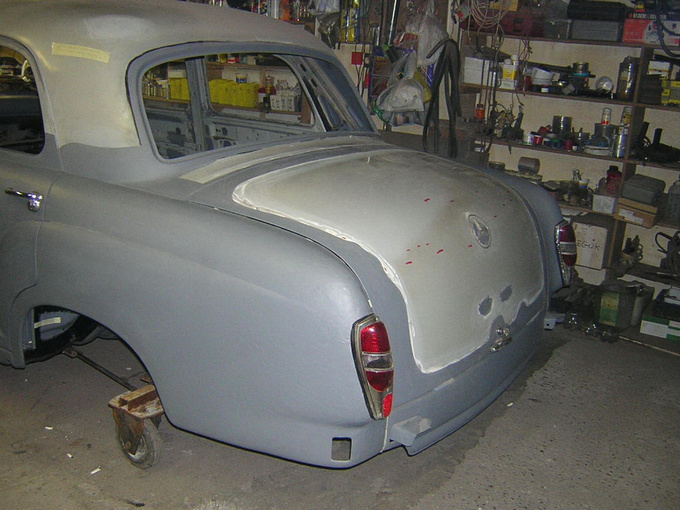 The chassis rails were just fixed, not replaced, the wings, doors, bonnet, boot lid are the originals. It took a lot of time but not because large parts of the body had to be replaced; the process was time-consuming because the Ponton's body structure is over-complicated like all early monocoque designs. It was the panel junctions that took up most of the time, but all in all it took Csabi seven months to bring it up to a brand-new standard. At the beginning of April, the Ponton finally headed to the painter: to a small place called Borsodnádasd, all reborn in its body. In the meantime, lots of work was carried out on other parts, but that's another story. Watch this space for the news. It takes some level of desperation to drive your M6 all the way to Frankfurt just to smash it with an axe outside the world’s biggest motor show.